Since the year 2000, the management and the works council of the voestalpine Group have been engaged in the joint development of an innovative concept that was very ambitious for many at the time. The idea was to let the employees participate in the company through shares owned by them, to turn them into a stable core shareholder by pooling their voting rights, and to allow them to benefit from the success of voestalpine as individual shareholders. At present, the voestalpine Employee Participation extends to the approximately 23,000 employees from all 52 companies of the voestalpine group in Austria and to approximately 2,700 employees from 97 companies in other countries. On their behalf, approximately 22.8 million individual share certificates in total – corresponding to 12.9% of the voting rights – are pooled and managed by a private foundation. The foundation also holds 1.97 million private shares (1.1 %) of employees. Representing 14 % of the voting rights of voestalpine AG in total, the voestalpine Mitarbeiterbeteiligung Privatstiftung is therefore the largest Employee Participation in Austria, both in terms of voting rights percentage and share value. The management and the works council developed the model jointly, and both are still fully in support of the Employee Participation plan. 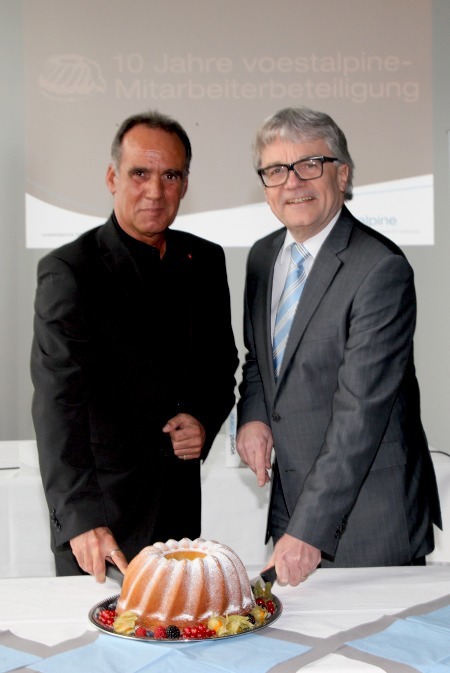 It is regarded as an example of “social partnership” in action – the internal cooperation between employer and employee for which voestalpine is well known. “At voestalpine, it is the people who make all the difference. They are at the heart of our success. Hence our conviction that our employees should share in this success”, says Dr Wolfgang Eder, Chairman of the Executive Board of voestalpine AG, about the motivation behind the model.